CASSIAN of BENEVENTO, believed to have been a Bishop of Benevento in the south of present-day Italy who reposed circa 340. However, he does not appear in any contemporary lists of bishops of that See. EUPLUS, martyred in the Sicilian city of Catania (304) for possession of, and preaching, the Gospel to the pagan population. Guide us into the haven of heaven. I endure this struggle willingly and with confidence! You rejoiced, O Euplus, to offer your head to the sword and so complete your course! EUSEBIUS of MILAN, a native of Greece, St. Eusebius served as the nineteenth Bishop of Milan (circa 449 – 462). In 451, he convened a Council in Milan, where the Tome of Leo was read and approved, hence this local council affirmed the Fourth Ecumenical Council’s condemnation of Eutyches' Christological heresy. GRACILIAN and FELICISSIMA, according to tradition, during the Diocletianic Persecution, St. Gracilian was condemned to death for the Faith. Whilst in prison awaiting martyrdom, a woman brought her blind daughter to St. Gracilian and he miraculously restored the sight of St. Felicissima. She embraced Christ instantaneously and was immediately baptised by St. Gracilian, and condemned to death. SS. Gracilian and Felicissima were martyred by beheading on the same day in the early fourth century. HERCULANUS of BRESCIA, a mid-sixth century Bishop of Brescia in Lombardy. No other reliable information on his life is extant. 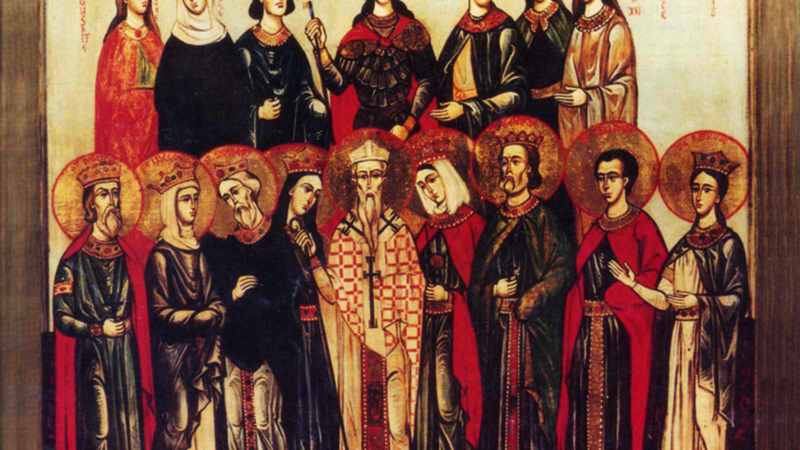 HILARIA, DIGNA, EUPREPIA, EUNOMIA, QUIRIACUS, LARGIO, CRESCENTIAN, NIMMIA, JULIANA, and COMPANIONS, (Fourth Century), a group of twenty-nine Christians in Augsburg who were martyred during the Diocletianic Persecution. St. Hilaria was the mother of St. Afra of Augsburg (5th August), and was burned alive, along with her three maids, Digna, Euprepia, and Eunomia, as they prayed at St. Afra’s tomb. The balance of these martyrs were killed in riots led by pagan mobs. JÆNBERT (JAMBERT, JANBERT, LAMBERT), an Abbot of St. Augustine’s Abbey who was consecrated fourteenth Archbishop of Canterbury 2nd February, 765. St. Jænbert reposed 792, and is buried at Canterbury Cathedral. MEREWENNA, (Date Uncertain), said to have been a daughter of King St. Brychan of Brycheiniog (6th April), St. Merewenna is the patron saint of Marham Church near Bude, Cornwall, England. According to some sources she is the same saint as St. Morwenna (8th July), also a daughter of St. Brychan. PORCARIUS (PORCHAIRE) and FIVE HUNDRED COMPANIONS, St. Porcarius was Abbot of the Abbey of Our Lady of Lérins when he was warned by an angel in a vision that the monastery was about to be attacked. He immediately sent off by ship all the young students, as well as thirty-six of the younger monks. Soon afterwards the monastery was attacked by Saracens (or more likely Vikings), and with the exception of four monks taken as slaves, the entire community of five hundred were massacred (circa 732). UST (JUSTUS), (Date Unknown), the patron of the church of St. Just near Penzance, and the town of St. Just, Cornwall, England is named for him. Some accounts state that he was a hermit, others a martyr, and still others claim he was a bishop. It is most likely there were two or more saints of the same name in Brittany, Wales, and Cornwall in the fifth or sixth century. However, the lack of reliable information makes it impossible to state with any amount of certainty specific details of his life.